The Agilent N6030A arbitrary waveform generator delivers unprecedented performance for creation of complex wideband waveforms. 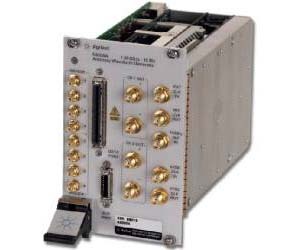 High sampling rate and high bit resolution provided in a single instrument enable designers to create ideal waveforms for accurate test of radar, satellite, and frequency agile systems. Each channel of the N6030A provides 500 MHz of modulation bandwidths and over 65 dBc of spurious free dynamic range. When the N6030A is combined with a wideband I/Q upconverter, modulation bandwidth of 1 GHz can be realized at microwave frequencies for authentic signal simulations for IF and RF subsystem test.